The Sony (Zeiss) Vario-Tessar T* E 16-70mm f/4 ZA OSS is Sony’s “top-of-the-line” mid-range zoom for APC-S format E-mount cameras. I myself own this lens and use it as my main “walk-about” lens when shooting with my Sony a6000. I principally shoot landscapes and occasionally architecture, so this review is very much through (excuse the pun) the lens of a landscape photographer. However, I will sprinkle in bits about how the Sony 16-70mm performs in regard to other types of photography as well. Read on more my real-world take on the Sony 16-70mm f/4 lens. The Sony (Zeiss) Vario-Tessar T* E 16-70mm f/4 ZA OSS is a mid-range zoom lens specifically built for APS-C (crop-sensor) Sony E-mount mirrorless cameras. Bearing the “Zeiss badge”, this lens is a design collaboration between Sony and Zeiss. Read more about the Sony/Zeiss relationship here. This lens utilizes Sony’s Optical Steady Shot (OSS), which improves image sharpness when shooting handheld images. Depending on the chosen focal length, the Optical Steady Shot image stabilization may not work below around 1/50 of a second. The lens comes with a lens hood, and front and end caps. Sony Vario-Tessar 16-70mm f/4 OSS attached to the Sony a6000. I love the size of this lens. It feels perfectly balanced with the a6000 lineup of bodies, making for a phenomenally easy package to carry in hand. The ultimate test was during a multi-day Grand Canyon backpacking trip where I literally carried this lens and camera in hand for dozens of miles of rugged hiking. I never got tired of carrying my camera with this lens attached! At a mere 10z, this is a very lightweight lens that can be carried on the camera body or in your pocket with no fuss. Sony Vario-Tessar 16-70mm f/4 OSS attached to Sony a6000 body with hand for scale. By and large, all of Sony’s e-mount lenses are very easy to use and work well with the Sony mirrorless bodies. This lens is no exception. It’s possible to pull this lens out of the box, strap it on your camera, and start firing off great photos immediately. What I really like is the manual focusing capabilities. When you turn the manual focus ring, the LCD/EVF on the camera zooms in (to aid in visual adjustments), and also shows the distance scale on screen. It’s a slick way of combining the old school manual focusing process with the latest features. The autofocus also works fantastic with the a6000-series, as I’ve rarely had a problem if ever had an instance of this lens missing focus. Shooting with Sony Vario-Tessar 16-70mm f/4 OSS at Valley of Fire State Park in Nevada. While this isn’t a necessarily fast lens capable to creating an extremely narrow plane of focus, it’s short-telephoto focal lengths on the long end are capable of creating out-of-focus backgrounds. And for what this lens is, it does create some reasonably nice bokeh. The f/4 aperture limit does, however, make this lens not incredibly attractive for portraits or other uses. My only real qualms with this lens is the sunstars it creates, although I have learned some tricks for making the best of them. Typically, the worst sunstars are created by cheap lenses that make sunstars that are asymmetrical or off-center. The 16-70 doesn’t have this problem. The problem lies in the fact that it tends to create messy sunstars. This typically happens if the sunstar is created with the sun fully observed in the frame, or if it is only obscured on one side (such as by the horizon). The way to finagle a good looking sunstar out of this lens is to make sure the sun is obscured on almost all sides, with only a very small point of light sneaky through. I’ve only been able to due this using vegetation and some very careful composing. This is unfortunate it makes it difficult to create nice-looking sunstars from grand landscapes when the conditions are changing fast. I’ve provided a few sunstar examples from the Sony 16-70mm below. A cleaner sunstar created by obscuring the sun on almost all sides. Creating a cleaner sunstar by shooting through vegetation. There other attributes to this lens that, given the price point, I see as neither positives or negatives, just factors you should also consider before purchasing this lens. Looking at the images from Sony 16-70mm with a critical eye, the sharpness is sometimes questionable at the wider and longer focal lengths, especially in the corner of the frames at narrow apertures. However, from my own real world experience, I think the sharpness of this lens holds up fine for the vast majority of purposes, even making fine-art quality prints. You might expect a little bit better performance out of a $1000 lens, yet I think its performance is reasonable considering the small and compact size of this lens. The build quality of the Sony 16-70mm f/4 is about what you might expect from a lens at this price point: very good, but not exceptional. It’s certainly no slouch. With all metal everything, it can definitely take a beating, and I’ve put this lens through at least one. The only possible qualm is the fact that the Sony 55-210mm f4.5-6.3 OSS telephoto lens, which retails for almost 1/3 of the price, has nearly the same build quality. An overhead view of the Sony Vario-Tessar 16-70mm f/4 OSS. Dings are visible where I’ve dropped the lens, but the all metal construction has still held up very well. While you might not necessarily expect to find weather sealing in a lens at this price-point, it wouldn’t be unheard of either. The real argument is based on the fact that APS-C cameras like the Sony a6300 and a6500 are weather-sealed bodies, yet Sony has yet to offer any dedicated APS-C lenses with weather-sealing. And being that the 16-70mm f/4 is Sony’s premiere APS-C zoom, I do think it is reasonable to ask: why this lens is not weather sealed? Despite the arguments that you can make about it’s price versus sharpness and build quality, I really like the Sony 16-70mm f/4. I’ve put it through the ringer, and I’ve found that it’s small size and excellent functionality are huge pluses for this lens. It’s built well enough to handle rough hikes, and for almost all practical purposes, it is a sharp lens. If you shoot weddings, portraits, street photography, ect., you might also find this lens useful, you’ll just have to be aware that its constant f/4 maximum aperture may not allow this lens to function well while handheld in low-light. It does have reasonably nice bokeh, although a fast prime lens is likely better suited for isolating foreground subjects. In the end, I’m happy to have this as my go-to lens that stays on my a6000 about 90% of the time. As a landscape photographer, I feel like this is a lens that is well-suited for my needs. If there was one thing I would change about it, I would love for it to make some cleaner and more usable sunstars. 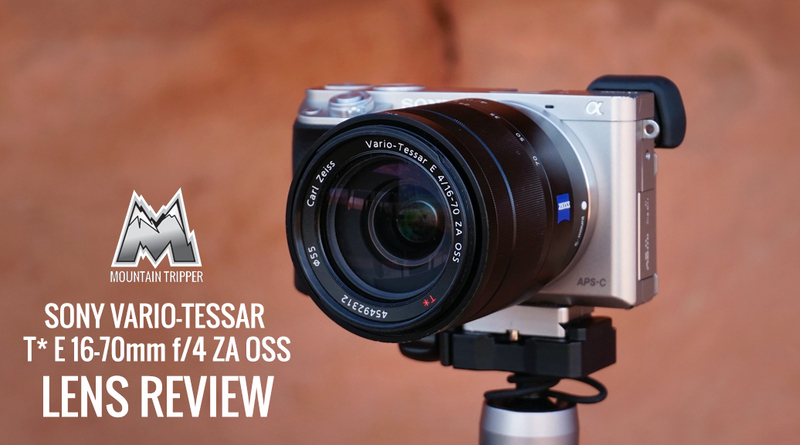 Overall, I do recommend the Sony (Zeiss) Vario-Tessar T* E 16-70mm f/4 ZA OSS as a solid mid-range zoom. Please feel free to leave your own thoughts or questions in the comments section at the bottom of this page! The “all metal” construction is in fact a thin metal shell over an all plastic lens.